Commercial flooring has to be durable, cost-effective, and attractive. Understandably, that can be a difficult set of requirements to meet. There are five popular options for durable commercial flooring, and each of them strikes its own balance between features and cost. Here are the pros and cons of each. Hard tile ceramic flooring is water-resistant and chemical-resistant. Consisting of multiple tiles of hard ceramic placed in grout, ceramic flooring is a versatile option that can work for virtually any commercial space. Tiles are available in multiple sizes and colors, and there are even tiles that replicate other forms of flooring -- such as hardwood. Hard tile ceramic flooring can provide a very elegant, sophisticated, or traditional appearance. Because there are tiles available that replicate either stone or wood, they can be used for designs that would otherwise not be durable enough for a commercial floor space. Ceramic tile is also fairly easy to install for experienced contractors. The most significant downside of ceramic flooring is that it's more expensive than many other commercial options, such as surfaced concrete. Grout can also be difficult to keep clean over time and the surface itself tends to be fairly slippery unless textured tiles are used. Because ceramic is a hard surface, it can also be uncomfortable over time -- something that rollout mats or interlocking tiles can address. One of the easiest to install options, rollout mats consist of a surface that is rolled out onto the floor and then trimmed to size. Most commercial spaces will require multiple rollout mats, which can then be seamed together permanently. Rollout mats consist of rubber and they offer a variety of colors, patterns, and textures. Rollout mats are a little more expensive than epoxy but cheaper than ceramic tile. They can be installed within a matter of minutes and can be easily replaced. Because they float on top of the sub-floor, very little preparation has to be done -- and they can be installed by anyone, without requiring a contractor. Because of the textures and patterns involved, rollout mats are generally ideal for garage spaces, work spaces, and other industrial locations. They may not have to polished appearance of either epoxy or ceramic tile, and they will not be as durable; they can rip and tear. 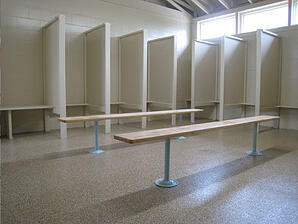 However, they are ideal for high traffic areas that need an affordable and durable flooring option. Tough, durable, and easy to customize, epoxy floor coatings are one of the best options for high-traffic commercial areas. Epoxy floor coatings are thickly applied directly to the floor, creating a resinous surface. Once the epoxy has cured, it will produce a hardened, polished surface that can successfully hide cracks, chips, and other issues on the floor beneath. Epoxy is not paint. It cures rather than dries, creating a much more resilient end product. Epoxy floor coatings are damage resistant, and will rarely chip or scratch. They also come in a wide variety of colors and appearances, and they can be textured to create a non-slip surface. Stain resistant and highly water resistant, epoxy floor coatings are ideal for areas that may experience chemical spills. They are generally used over a concrete surface, so they are also very shock resistant -- there is no gap between the floor and the sub-floor, forming a bonded surface. Of course, there are also some downsides to an epoxy floor coating. Installing an epoxy finish is a challenging task that should be left to only the most experienced of professionals. At-home epoxy kits and non-commercial grade kits tend to be of poor quality. Additionally, since the entire floor is a single surface, a crack can spread very easily; the floor needs to be carefully maintained. Similar to an epoxy, a sealer is applied directly to concrete. But unlike epoxy, the concrete isn't completely covered. Instead the sealant soaks into the concrete and fortifies it, improving upon its ability to repel water, chemicals, and stains. The structure of the concrete itself will be unaltered; the floor surface will be just as strong as concrete is. Concrete sealers can last up to a decade. A concrete seal is essentially concrete but improved. It's extremely affordable and simple, and sealing can be repeated as necessary. For applications in which a concrete floor is suitable, a seal can further protect the surface. Concrete sealing does not take long to complete and can be done by anyone. Because concrete sealing doesn't improve upon the structure of the concrete, the floor may still experience significant wear in high traffic areas. The appearance of the floor may also be too industrial for some commercial applications. Concrete sealing will not be able to provide a non-skid surface if the concrete itself is polished or smooth. 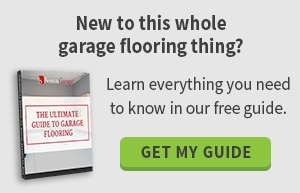 Interlocking floor tiles operate similarly to garage floor mats; they are placed directly over a concrete sub-floor without any need for preparation. These floor tiles are often made out of rubber, plastic, or vinyl, and they have a variety of colors and textures just like a garage floor mat. Because they come in easily placed tiles, they are very versatile and easy to install. Because snap-together tiles are so versatile, they can be used to create unique patterns across your commercial space. The texturing provides a non-skid surface, and the ability to replace a single tile at a time makes it easy to maintain. Snap-together tiles are a little more expensive than mats but still cheaper than ceramic tiles. In terms of negatives, snap-together tiles still aren't as durable as hard ceramic tile, epoxy, or even plain concrete. Instead, snap-together tiles essentially protect the concrete sub-floor for significant damage. Snap-together tiles may also take a little longer to install than mats because each tile has to be installed individually, but they are still faster and cheaper to install than more permanent options. Which type of flooring is ideal for your commercial space? It really depends on your company's unique needs. High volume commercial spaces, heavy equipment, and potential chemical spills may all dictate whether a certain type of flooring is ideal. Client-facing areas may find that hard ceramic tiles are more friendly and sophisticated, whereas garages and workshops may want to invest in a resilient epoxy. Commercial spaces on a budget may find that garage mats or interlocking garage tiles form a good balance between cost and durability. To learn more about your commercial flooring options, contact us today!